MVS is our multiple-port, multi-vehicle fast charge system, especially designed for distribution, warehousing, and general manufacturing. 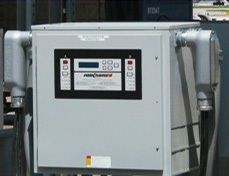 Each system charges up to 16 low to medium duty industrial vehicles (e.g. all pallet jacks, reach trucks, tow motors) at the same time. The more vehicles charged at once, the highest the cost benefit. And, like the DVS, MVS features the highest power quality and most diverse multi-voltage, multi-amperage flexibility of any fast charging system available today. MVS systems are installed all across North America, including Fortune and Global 100 retailers, wholesalers, and various manufacturers.